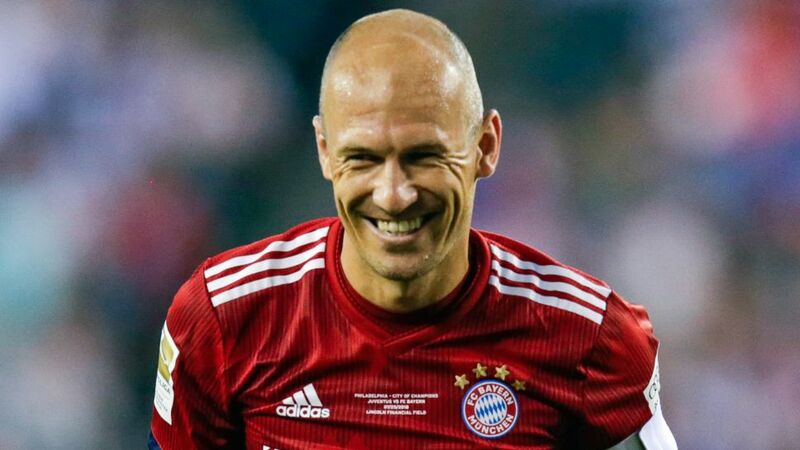 Ahead of his 10th season in the Bundesliga with Bayern Munich, Arjen Robben admits he never expected to be at the club for so long, but says joining the record German champions was the best decision of his career. The 34-year-old Dutchman swapped Spain's Real Madrid for Bayern in summer 2009, and has gone on to win multiple titles, including seven Bundesliga championships, four DFB Cups and the 2013 UEFA Champions League. He is also the Bavarians’ second-highest foreign Bundesliga goalscorer (95), behind current teammate Robert Lewandowski (126). "I don't think I expected to be here for so long – but then again, yes. I'm always a realist, and I know the world of football moves fast. It could have been very different," Robben said in an interview with Bayern’s official club website. "After my pro debut for Groningen, I was at [PSV] Eindhoven for two years. It was a big step for me in the Netherlands, leaving home at the age of 18. I went abroad when I was 20, three years at Chelsea, a big club. Then two years at Madrid. Then Bayern approached me and I made the decision. I was skeptical at the start; I didn't know whether it was the right decision. I can now say it was the best decision of my career." Robben, who turns 35 in January, will begin the latest chapter of a storied career on Friday, when Bayern begin their pursuit of a seventh successive Bundesliga title at home to Hoffenheim. Although the retired Netherlands international has won seven of his nine career meetings against the Sinsheim outfit, scoring five goals, he insists Bayern need to be at their very best to get a result against the team that finished third in the Bundesliga last season. "I think it's going to be a very, very difficult match," Robben said. "It's not going to be a walkover, they're in incredibly good form. They won against strong teams by high scorelines during pre-season, they won their cup match 6-1. They're a very good team. We have to put up a fight on Friday and be alert from the off, otherwise, it might be an unpleasant evening. We don't want that - we want to get off to a good start in the Bundesliga." If Bayern do open with a win, it will consolidate their billing as title favourites. The Munich giants ended the 2017/18 campaign some 21 points clear of runners-up Schalke and 29 ahead of Hoffenheim. Only in the treble-winning season of 2012/13 was the margin between first and second greater - not that Robben is expecting anything other than a fight to the finish in 2018/19. "It's not as easy as many people say it is," he warned of Bayern’s chances of claiming a 28th Bundesliga title - what would be his eighth in the colours of Germany’s most successful club. "We have to go full throttle to clinch the title. It'll be another fight this season, but we’re ready. I’m glad it’s starting up again." Follow Bayern Munich's Matchday 1 clash with Hoffenheim HERE!